Ultrasound imaging is a noninvasive medical tool that aids the physician in diagnosing and treatment of medical conditions. Ultrasounds are painless and well tolerated by most patients. 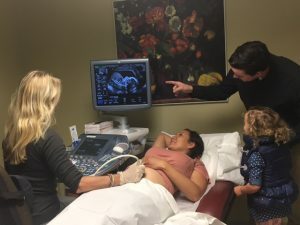 Ultrasound is used in both women’s health care and pregnancy. It can be used to diagnose and monitor certain problems, such as a pelvic mass, a breast lump, abnormal bleeding, pelvic pain, fibroids or infertility. During pregnancy it can be used to monitor the growth and development of the baby and helps in determining the age of the baby, location of the placenta, fetal position and amniotic fluid levels.